Signs and displays come in all sorts of shapes and sizes. Digital technology has helped push the boundaries of this sector, with marketers and brands having access to all sorts of possibilities when promoting their products. From digital signage that interacts with consumers, to giant displays that travel the seas with holiday-makers on a cruise ship, new developments in this market are plentiful and exciting. Description: Visual intelligence company PerceptIn has taken signage to another level with its DragonFly Intelligent Advertising Vehicle. The new device makes usually-static signage mobile, exposing the sign and its content to more people. The DragonFly Intelligent Advertising Vehicle will launch in the US early in 2019. Description: Premier Peru shopping destination Plaza Norte joined forces with Samsung to install the largest digital-out-of-home LED signage in South America. The Samsung XA160F SMART LED Signage outdoor display measures in at a huge 487sq m.
Description: JCDecaux commissioned globally renowned Zaha Hadid Design to create this spectacular advertising structure in Kensington, London. The site features a curvilinear ribbon of matt steel, framing a curved digital screen, with a digital screen measuring 26 x 6m. Description: Although still a relatively new concept, esports has gathered a huge audience around the world, with millions tuning in every week to see how their favourite players and teams are getting on. 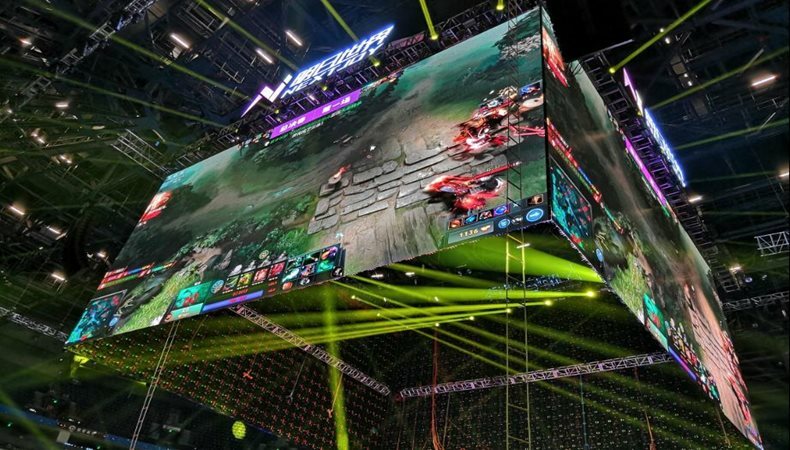 G-League, the first major, established tournament, worked with Absen to install this impressive LED display for its G-League 2018 competition in Shanghai. Description: Global fast food brand McDonald’s partnered JCDecaux Colombia on this campaign to celebrate 50 years of the Big Mac. Consumers were challenged to copy a dance on the digital screen; those who succeeded were awarded a ‘Mac Coin’, which they were able to exchange for a free Bog Mac burger. Description: Samsung Display Company set new levels of innovation in 2018 by developing the world’s first ultra-high definition (UHD) video wall panel. The 46-inch, 3x3 Full HD installation offers resolution four times higher than FHD video walls currently available on the market, according to Samsung. Description: JCDecaux produced these solar-powered bus shelter signs for the Roland Garros French Open tennis tournament. Working with organiser the French Tennis Federation, JCDecaux installed three shelters with photovoltaic roofs for the two-week period of the competition. The roof produced enough energy to power the display box and the LED lighting of the ceiling lamp at night. Description: LED application products and integrated solutions provider Unilumin Group joined forces with Gorizont LED to produce this eye-catching display at Rostov Shopping Centre in Russia. The screen had to be carefully integrated into the sloping design of the building. Description: Stadium technology specialist ADI helped English Premier League football club Wolverhampton Wanderers expand its commercial opportunities with digital signage. The double perimeter LED system can either run as a single display or be split into two, meaning the club can double branding exposure with the push of a button. Description: JCDecaux Colombia joined forces with Baileys on this interactive digital signage campaign. Playing a game on the digital sign, consumers were able to create their dream Baileys milkshake. Description: MS Roald Amundsen, the world’s-first hybrid powered expedition cruise ship, recently set sail with the tallest LED screen at sea. Developed by ProntoTV, the display measures in at 17.5m high and spans some seven decks on board the cruise ship, displaying a live 360-degree feed from the ship’s mast, underwater drone coverage and a host of other content. Description: Southampton was another Premier League club that took advantage of new technologies to increase its commercial appeal to fans around the world. Working with ADI, the club installed signage that changes depending on where in the world fans are watching televised games. The content on the signs is tailored to specific geographical regions. Description: Visual communications specialist RMG Networks produced a range of new signage for the world-famous Kennedy Space Centre, the launch site of many NASA space missions. The highlight of the project was this signage that was installed on the Astronaut Training Experience attractions, where visitors can try their hand at qualifying to become an honorary astronaut. Description: Immersiv joined forces with BrightSign to create this impressive installation at the Real Madrid World of Football, a state-of-the-art, digital and physical interactive football experience. Visitors were welcomed by two video walls, each with eighteen 49” HD panels powered by 12 XT243 BrightSign players programmed by Amped. Description: AV system integrator Sysco teamed up with UK distributor PSCo to install Europe’s largest ceiling-mounted LED screen at London’s Fen Court. Using tvONE’s CORIOmaster mini video to drive the system, the display features a live feed from the roof of the building, making it seem as if the outside is indoors. Description: Although perhaps not seen as a traditional sign or display, number plates are one of the most common form of displays in the world, and now they are going digital thanks to US company Reviver. Rplate is the world’s first digital number plate platform, replacing the standard stamped metal licence plate in the US. Rplates are currently being sold in California and Arizona and have full approval in Michigan. Description: We couldn’t finish our top 20 without honourable mentions for two of our winners at the FESPA Awards 2018. HNS Signs took home a Gold award after delivering a mix of traditional sign-writing with a classic edge to support the opening of two new Ted Baker stores in Bicester and Oxford. Description: Our second FESPA Awards 2019 winner is The Look Company, which won a Silver award in recognition of this project. The company helped brand the office interiors for the Supreme Committee, the highest authority for Sports in Qatar. Advances in both print and digital technologies are likely to push this sector even further forward over the next year and beyond, as brands and marketers work with experts in the industry to develop new and innovative ideas. To keep up to date with the latest movements in this market, industry members can visit the FESPA European Sign Expo 2019, which will this year again take place at the main FESPA Global Print Expo in Munich, Germany. It is Europe's largest exhibition for non-printed signage and visual communications. Over 4 days visitors will have the opportunity to experience the latest products and innovations on display from over 100 exhibitors. Please use promo code ESEH901 to register for free.